It’s one of the oldest stories in the world: Two people are getting to know each other, and while one couldn’t be more smitten, the other just isn’t that interested. This nearly always leads to some awkward moments, though sometimes it doesn’t play out in quite the way you might expect. In The Story of 90 Coins, Wang Yuyang (Dongjun Han) tells Chen Wen (Zhuang Zhiqi) that he wants them to be together forever, but all she can say in reply is that she doesn’t feel the same. In some stories this would be the end, but here it’s only a beginning. Quietly convinced that they are meant to be, Wang Yuyang makes one last effort to win her heart, asking for just 90 days in which to change her mind. Something makes Chen Wen agree, and the quest begins. At the end of each of the 90 days, Wang Yuyang presents Chen Wen with a coin folded into a note he’s written to her. The 90 coins add up to about nine dollars, conveniently the cost of a marriage license. After the 90 days are done, Chen Wen, while not so sure she’s ready for marriage, is sure that she doesn’t want to lose Wang Yuyang. But romance always ends up giving way to real life, and sometimes we get so wrapped up in work, running errands, and paying bills, we lose sight of more important things. When Chen Wen is faced with a major decision that might take her away from Wang Yuyang, the beautiful promise of those 90 days might be lost. Dongjun Han is both earnest and intense as Wang Yuyang, while Zhuang Zhiqi couldn’t be more charming as a young woman trying to stay true to her heart and find her place in the world, never an easy balancing act. The film also has a balance to strike and manages it beautifully, portraying a relationship that is both romantic and realistic. And the things that come between them are equally real, leading to the sort of dilemma anyone might find themselves facing. There is also more than a hint of magic to the film, however, a spell woven in those 90 days that changes the characters’ lives forever. 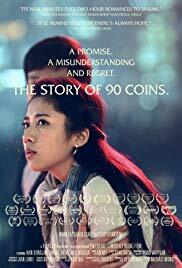 It does sometimes seem like there’s less hope out there than there used to be, but The Story of 90 Coins asks us to believe that the world is still a beautiful place, and that a promise can mean everything. Somewhere — perhaps in an isolated old basement — is a kitschy, neon-lit room where a tattooist turns skin into works of art. A tattoo of such quality is no doubt very expensive, perhaps in more ways than one. For this tattoo parlor holds many secrets, almost as many as its owner. 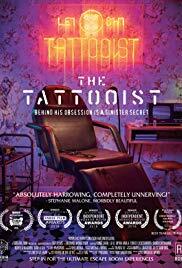 The Tattooist is an award-winning micro-short horror film from Michael Wong, so I can’t tell you much more about it other than that it’s probably the creepiest minute and a half of film you’ve seen in a while, with both screaming, in your face terror as well as undertones of more subtle psychological fears. The tattooist takes great pleasure in all aspects of his work, and he has something of a dream job for those who enjoy inflicting pain — but above all else he is a true artist, and his medium is pure terror. This teaser film hints at great and terrifying things for the extended version which should hopefully follow soon. In these days of ancestry.com and genetic testing through the mail, it’s becoming normal both to rediscover forgotten relatives as well as find out about relatives you never knew you had. And it must be disconcerting to be informed via e-mail that you might have a long-lost relation out there, when you always thought you knew every Cousin Joe and Aunt Celia you have. Better informed relatives must frequently have some awkward explanations to make about these situations. In Long Lost, the twenty-something Seth (Adam Weppler) gets a letter inviting him to the house of the brother he never knew he had, literally. The wealthy Richard (Nicholas Tucci), who lives in a lavish house in the country, has decided it’s time to get to know his younger half-sibling, and what better way than to let him stay for a while? The first surprise is how stern Richard is, not exactly the image of a man anxious to get to know his last surviving relative. At first all his conversations with Seth revolve around Richard complaining about how stupid Seth is and what bad decisions he’s making in regards to the internet business he’s trying to start up, which isn’t really happy reunion material. The second surprise is Richard’s live-in girlfriend, Abby (Catherine Corcoran), who Richard never bothered to mention. She frequently ends up playing peacemaker between the two brothers, assuring Seth that he’ll get used to Richard, though I never believed her myself. Richard’s reactions are wildly unpredictable, for one thing, and for another he likes to turn everything into a game… which wouldn’t be so bad if he wasn’t also a sore loser. Nothing like welcoming your long-lost brother home by ignoring him. To make things even more complicated, Abby is a little too interested in Seth and seems to have more in common with him than her boyfriend. Between this and Richard’s idea of teasing — I know sibling teasing can get rough, but he always seems more like he’s trying to start a fistfight than anything else — the visit is a tense one, to say the least, and Seth has to be very forgiving. Inevitably, however, Richard’s games start to veer into much stranger, darker territory, and Seth will have to decide how far he’s really willing to go in the name of brotherly love. I’ll give it four and a half out of five. There’s a wonderful slow build to the movie, and the interplay among the three characters is compelling. Each has their own (often contradictory) motivations and expectations, and the underlying power struggles are realistic and convincing. Tucci’s performance as the volatile Richard steals more than a few scenes, but Corcoran as the quietly intriguing Abby and Weppler’s portrayal of a young man still trying to cling to his ideals more than hold their own, creating an intricate web of relationships. Family can be complicated — and in Long Lost, the complications run further than you’d ever imagine. If you’re used to the amenities of even a smaller city, life in a small town might seem more like life on another planet. Maybe you might luck out and there’ll be a pizza place that delivers until 8:00, but you aren’t exactly going to have a lot of options for eating out. I went to a high school in a town of about 2,000 people and it was big news when the Dairy Queen opened up. Of course there were bars, but about the only other place available to hang out was the bowling alley where you might pick up an overdone hot dog. This might seem laughable if you’re used to New York or Chicago, but some do prefer a slower pace to life and like knowing all their neighbors. If you aren’t cut out for the quiet life, though — as seems to be the case with many of the characters in Pusher — it’s easy to fall into some very bad habits. The stereotype of the dealer loitering on an urban street corner isn’t necessarily all that accurate; today the “average” dealer is just as likely to live in a double-wide on the gravel road by the factory where half the town works, selling prescription meds to friends and neighbors. That’s basically how Brittany Lee (Andi Morrow, Here Lies Joe) runs her business, taking in supplies from Hailey (Dara Tiller) and passing them on to loyal customers like James (Levi Krevinghouse). This particular business causes some awkward situations — Brittany and Hailey can barely stand each other, and while James and Brittany might once have gotten along great, these days they hardly know what to say to each other. James and Brittany share an incredibly awkward moment. And Brittany, feeling the sudden, powerful effects of guilt, wants to talk to James, to try to make amends, but they’re as stuck in this pattern as they are stuck in the town. 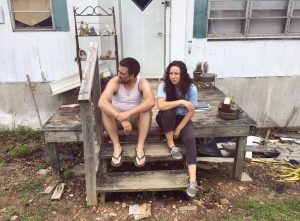 James has no support system to turn to, and Brittany has few options for making a living in an area that’s clearly deeply economically depressed. And so the vicious cycle continues. Yes, it is a downer of a film, but it also encapsulates modern small town life, with an ending that’s both oddly unexpected and utterly inevitable. The cast and crew have also made it intriguing, through often brutal realism and the occasional flash of the dry, dark humor that helps the characters get through their lives. Some days might be hopeful, others despairing, but all anyone can really do is to take them as they come. Morrow and Krevinghouse convincingly portray the bizarre, dependent dynamic between a dealer and a client who grew up together, against the backdrop of a town clinging to its existence. This could be any town — yours or the next one down the highway, and the people could be you or anyone you’ve ever known, all of them just muddling and struggling through from day to day. It’s easy to get in the habit of thinking of some people as larger than life heroes. We’d all like to think that police officers, for instance, are incorruptible, or at least close to it. But they’re as human as the rest of us, and sometimes that will lead to them turning to the dark side, with consequences they might never have imagined. In Dragonflies Only Live For 24 Hours, two police officers take one fateful step that eventually leads them down a rabbit hole of corruption and lies. Part of the problem is that Parker (Judson Vaughan, director of Burn) and Frankie (Karl Kennedy-Williams) are convinced they’ve been unjustly passed over for promotion. And it can really hurt, to feel like you’re being denied something you’ve worked hard for, for no good reason. Considering how far these two go to set things “right”, however, it’s very possible their boss just had a hunch he’d better promote two other guys instead. Frankie and Parker are great friends, though, who stick together even when one of them comes up with an idea that is, to put it mildly, bizarre. They’re a pretty good example of a shared psychosis, actually. Frankie and Parker keep the streets safe from those who dare to steal garden decor. Anyway, they consider themselves to be firmly on the side of good as they scheme to go a step further than usual, preventing crime instead of just arresting the bad guys after they’ve already ruined (or taken) someone’s life. Of course, anyone who knows anything about Minority Report, either book or movie, knows that this idea is problematic at best, and these guys don’t even have any precognitives around. But as their plans and schemes grow more intricate and more deadly, it also gets harder to know who to trust, not to mention harder for the viewer to look away. Kennedy-Williams and Vaughan have to carry the show, and they do so brilliantly, creating absolutely believable, fallible characters who are like brothers, joining forces against the world and breaking all the rules — and quite a few laws — in pursuit of a higher purpose. Unfortunately, sometimes the higher purpose gets a little blurry, and the old saying about fighting monsters definitely applies. The supporting cast does an equally stellar job of bringing the often dark world of the film to life. Throw in a little humor, a little irony, and some of the most ruthless schemes and unexpected twists you’ve ever seen, and you’ve got a four and a half out of five star film that takes the entire idea of a cop movie to new and impressive heights. These days, if reality shows are your thing, you have an overwhelming array of such shows to choose from, and even movies are getting in on the act, at least in satire. But in large part because it’s so widespread, attempting to spoof the “reality” genre — which is, of course, one of the most unreal things out there — is a tricky business. Most of these shows are already ridiculously over the top, so trying to push them further isn’t always going to work out so well. 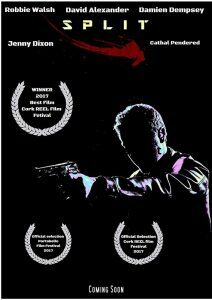 But Split, a feature film from Ireland, goes boldly where no film has gone before, at least as far as I know: it’s a movie about a documentary crew following two hit men as they go about their, er, normal day to day business. Our protagonists don’t even get names; they’re credited as Hitman (writer-director Robbie Walsh) and Hitman 2 (David Alexander). Which makes sense since they’re doing at least six illegal things before breakfast every day, but which also doesn’t make sense as they’re both willingly being filmed doing said illegal things. Maybe the plan is to blur their faces in post-production, but if I was a hit man — hit person, whatever — I’d never rely on anyone else’s thoroughness. But I always assume the worst, in that once that recording is made you can never be 100% sure that the wrong person won’t see it someday. Basically, if you’d be mortified (or arrested) if your video ever made its way out into the world, then just don’t record it in the first place. These guys don’t care about that sort of thing, though. Maybe they think those worries are for sissies. Anyway, these are two very busy days in the lives of our “heroes”, so the camera crew also has a lot to do. None of their targets are exactly regular people — the vast majority of us will never have to consider the possibility of being executed by a professional assassin — but there is also the occasional, inevitable instance of collateral damage for the two to deal with. And each of them has a very different approach to their work, with First Hitman being the thoughtful one, at least relatively, while Second Hitman seems to think there’s no reason to have this job if he doesn’t get to be the ultimate tough guy and not worry about the small stuff like innocent bystanders. Like all of us, though, they have dreams for the future, and since I doubt they get benefits like insurance, it’s no wonder they have to work hard if they want to retire to that nice beach someday and drink pina coladas. It’s as weird and wild as you might expect and then some, not to mention surreally funny. The camera crew, for instance, can’t stop asking everyone questions no matter how tense the situation. Most people hiring a hit man just aren’t going to want to stop for a quick interview as to their motivations, however much of a loss this might be to posterity, and pestering someone facing imminent death as to whether or not their life is flashing before their eyes is rarely helpful. Despite their profession, First and Second Hitmen are rather likable, even if you might not want to risk getting a drink with them, and though they might harass each other, in the end they’re a true team. There’s shockingly little blood and plenty of swearing, but most of all it’s a thoroughly fascinating look at how the less law-abiding among us live, and the craziest and most bizarrely entertaining mockumentary you’re ever likely to see. Even the worst workaholic probably has some kind of hobby to help them unwind. Granted, hobbies can sometimes get pretty specific and therefore incomprehensible to those of us who don’t enjoy whatever it is. I like to relax by playing quizzes on Sporcle, which to some might seem an awful lot like deliberately reliving high school where everything will be on the test, so I understand people thinking it’s weird. In the same way, I certainly wouldn’t be interested in the hobby Gil (József Gallai) enjoys in Spirits in the Dark. Gil, you see, likes to explore abandoned buildings and doesn’t mind doing so after dark. You couldn’t pay me enough for this kind of expedition, and it isn’t because I scare easily, or at least not just that. I’d constantly be worrying about the ceiling caving in or the floor giving way. Anyway, Gil and his wife Stephanie (Beáta Boldog) both enjoyed this, so I guess they were made for each other. Sadly, both Stephanie and their daughter died in childbirth, leaving Gil to explore alone with his camera. See, this isn’t even a nice place to visit. Then Gil discovers some mysterious footage on his computer, footage of someone exploring an abandoned building he’s never seen before. He finds the structure intriguing, but what really stuns him is a closeup image of a white crystal necklace exactly like the one his wife always wore. 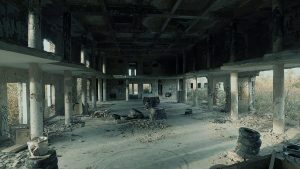 Managing to track the location down, Gil finds himself in a deserted complex of buildings, supposedly a former military complex, with the main structure also the site of the video. I was just thinking it looked like Pripyat when Gil agreed with me, and the place definitely has the same grey, institutional design as well the same unsettling air of having been hastily abandoned to the elements. As his eerie walk through the crumbling, deserted hallways continues, it’s as the mystery footage suggested — Gil isn’t alone. But what haunts these halls isn’t quite what you might think, and Gil faces an unexpected test of courage that goes far beyond ghosts. There’s a beautifully scary slow build to this film, with every shadow hiding a secret and every half-seen movement a threat. Gil, still quietly grieving his loss, is a relatable Everyman — albeit one with a strange hobby — turned into an unlikely hero. The setting is a terrifying, palpable presence, with an atmosphere that weighs on you even through the screen. Best of all, the ending makes you think. It’s a creepy and compelling film from József Gallai, who also wrote and directed, that gives another layer to the usual abandoned building tropes. It proves that you never know what nightmares — or miracles — you might find when you explore off the beaten path. It’s easy to go a little off the rails after the loss of a loved one. The situation can be even worse when the loss comes after a prolonged illness and you’ve been forced to watch someone you care about fade away bit by bit. That’s what happens to Diana (Diane Bakos) in the short film The Last Fishing Trip. She’s been looking after her brother Edward (Mike Connelly) in his final days, and now that he’s gone she finds herself deeply lonely and uncertain as to what to do next. Clinging to the memory of the last good experience she and Edward were able to share — the fishing trip of the title — Diana packs a suitcase and drives from her small town to New York City, just because Edward had wanted to visit the Big Apple. With nowhere to go and all day to get there, she wanders through Times Square and rides the subway aimlessly. Then she has a conversation with Patrick (Lester Greene of Night Job), a New York native who offers her a tour of all the best spots. At first an emotional wreck, Diana finally begins to find some peace through Patrick’s quiet, accepting approach to living. But even if she has help this will still be a difficult and overwhelming journey, and there may be setbacks ahead. She might just end up making a leap of faith that could help her learn to trust life — and herself — all over again. Writer-director Christopher Fox offers up a quietly thoughtful look at what can happen when we’re faced with mourning a loved one and the prospect of our own mortality at the same time, a combination that might crush anyone’s spirit. Diana’s grief is raw and palpable, and at times it seems as though no one, however kind and well-meaning, will possibly be able to help her through. 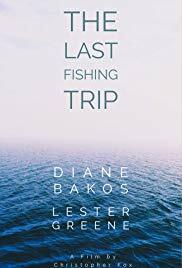 But ultimately there’s hope here — from Greene’s compelling portrayal of Patrick to Diana’s first steps back to something like normality. Sometimes the worst day of your life can take you exactly where you need to be. At some point in their lives, nearly every kid has a phase that involves a lot of obsessing about monsters. Most of us outgrow this; the rest get into the horror movie game, one way or another. Of course, the big problem most kids face is convincing the grownups in their lives that the monsters are real. In the short film Slapface, however, one boy (Joshua Kaufman) faces a slightly different dilemma. You’re never really alone in the woods. 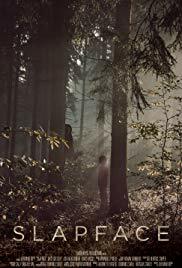 For one thing, he seeks out the monster (Lukas Hassel) that lurks in the woods where he lives with his widowed father (Nick Gregory), when usually kids do everything they can to avoid said monster. Possibly he’s trying to prove his bravery, but equally possibly he finds playing with monsters preferable to going home. Let’s just say that his father has some strange ideas about what makes good parenting, and his definition of a game isn’t at all like mine. It’s often hard to tell where the real danger lies in this film, and trying to figure it out will more than hold your attention. The relationship between father and son is complicated, to say the least, and the addition of a monster to the mix won’t make things any easier. As often happens with short films, there isn’t enough time to explore all the questions the movie raises, but the questions alone are fascinating. Writer-director Jeremiah Kipp handles the movie and its undertones deftly, creating something much more than just a monster movie, and I look forward to seeing more of his work. Whether they involve friends, family, or significant others, relationships change whether we want them to or not. Friends can drift apart, family dynamics can shift in different ways, and love can fade. That’s what’s happened with Gunther (Timothy J. Cox) and his wife of three years, Natalie — it seems as though the simplest remark can start a fight, and Gunther just isn’t happy any longer. Happiness in a plain brown wrapper. Enter raven-haired Dorri, Gunther’s new flame and apparent soulmate. He showers her with gifts and affection, and poor Nat is completely forgotten. I’m not sure how much Nat minds, though, since she’s a total airhead. No, I’m not being mean: both Nat and Dorri are inflatable dolls. Yes, those kinds of dolls. Admittedly Dorri has a more human face, but she’s also getting perilously close to uncanny valley territory. And perhaps with more human looks come more human flaws as well, for as it turns out even Dorri has her secrets. Has Gunther lost every possible chance at happiness? It’s a thoroughly zany concept for a short film that takes itself absolutely seriously, to fantastic effect. It’s human nature to sometimes want something simply because we can’t have it, never more so than in affairs of the heart, and this wild satire drives that home. Gunther’s struggles are more than a little laughable, but we can also sympathize with Cox’s pitch-perfect guy next door performance, even as we feel a little superior to him. After all, we’d never treat OUR relationships like they’re so utterly disposable — would we?